A day after George H.W. Bush was honored as a statesman in Washington, his grandson and namesake George P. Bush spoke about the family man who loved fishing and adventures with loved ones and preached a life of service. 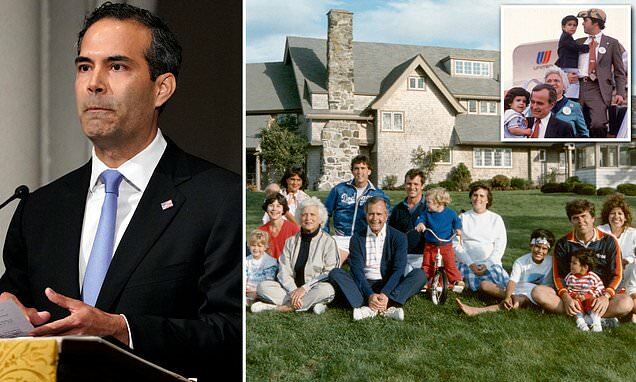 George P. Bush, who is Texas land commissioner, spoke in personal terms about the impression his grandfather made on the Bush grandchildren, recounting stories form the ancestral home in Kennebunkport, Maine. The son of former Florida Gov. Jeb Bush also spoke of the credo of service that the late president instilled in his children and grandchildren, who make up one of the nation's enduring political dynasties. George P. Bush recalled images of his grandfather 'fly fishing off the rocks in Maine, talking up where the Bluefish were running' at the family compound. As testament to how much his grandfather valued family, George P. noted that he began a 1988 book released around his run for president with a letter to his grandson. 'P, the letter read: "I've been thinking about it a lot the most fun was the big rock boat. Climbing out on it, watching you and Noelle playing on it,"' he said, recalling the time he and his grandfather – a naval officer like he would later become. Noelle Bush is another granddaughter that was part of the sprawling Bush clan. 'Near the end of summer, when the moon was full, the tides were high, there was that special day when it almost seemed like the boats was real,' the grandson told mourners gathered in Houston for the Bush funeral service. 'In those few words my grandpa said more about his life than I could tell you,' he added. He spoke as the late president's flag-draped coffin faced the altar in St. Martin's Episcopal Church.